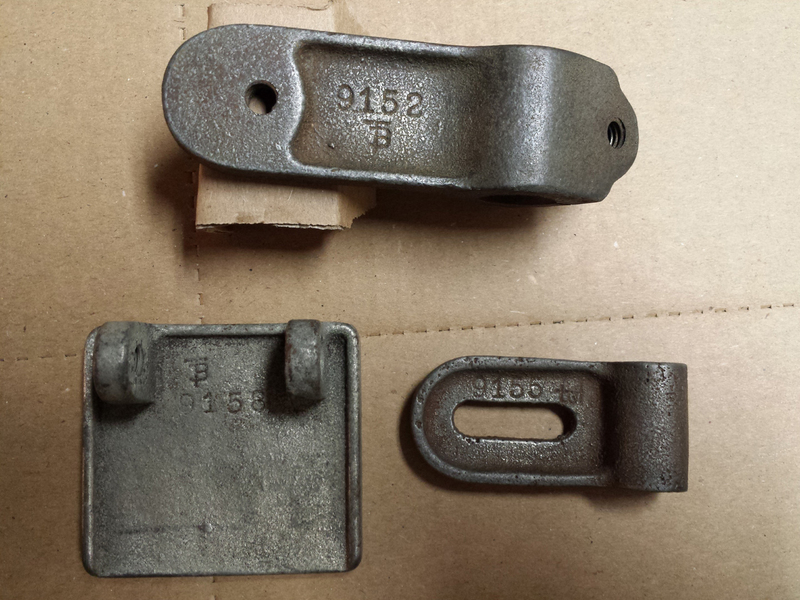 Components of the beefy tool rests. That's a 3/8" Craftsman thin profile ratchet for scale. If you haven’t read my earlier posts, use the search menu. 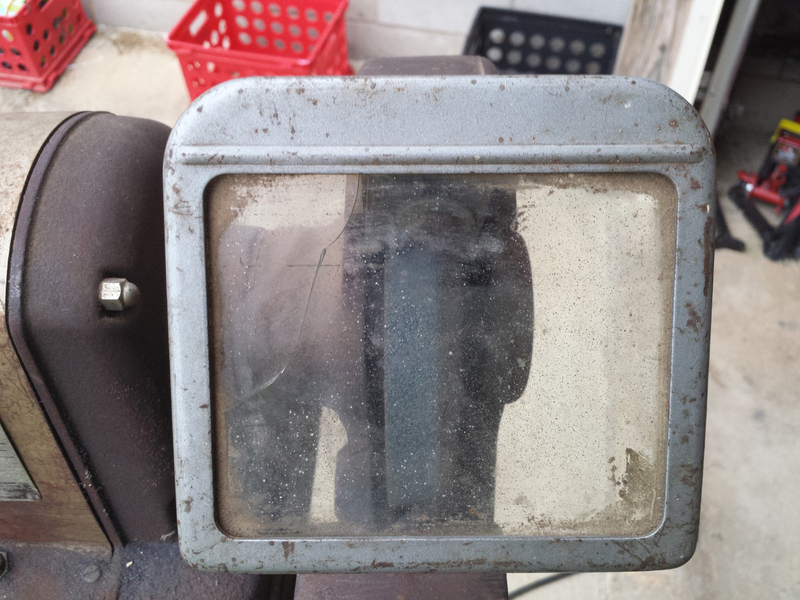 After evaluating the exterior, I began restoration work on the exterior case and stand. Some parts, like the outer wheel guards, just needed a trip through the electrolysis bath, some scrubbing with a nylon pad, and then a wipe down with acetone before being primed. I had a guy weld up the cracks in the inner guards, but I wasn’t completely happy with the work. 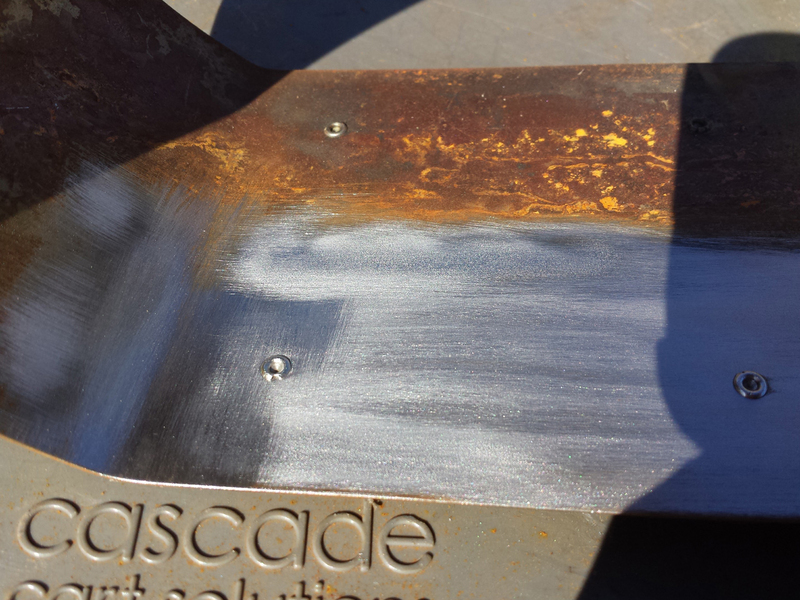 I cleaned up the welds on this inner guard with an angle grinder. I ended up buying a replacement set of inner wheel guards from a guy who knew a guy on GarageJournal. Here is one being stripped before its electrolysis bath and wire wheel time. The other one had some minor cracks as well, so I ended up using one original guard and one replacement guard. 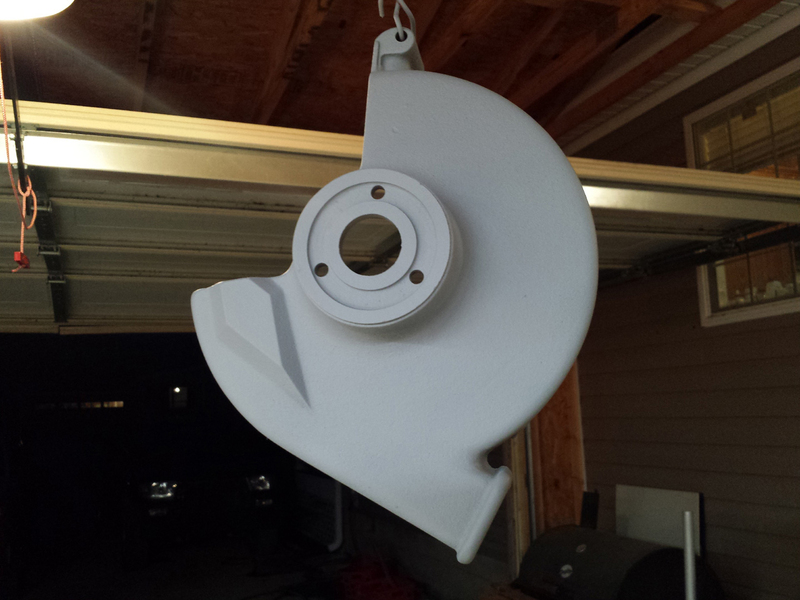 I primed the inner wheel guards after cleaning them up. The center band was a mess of marks and bad paint. 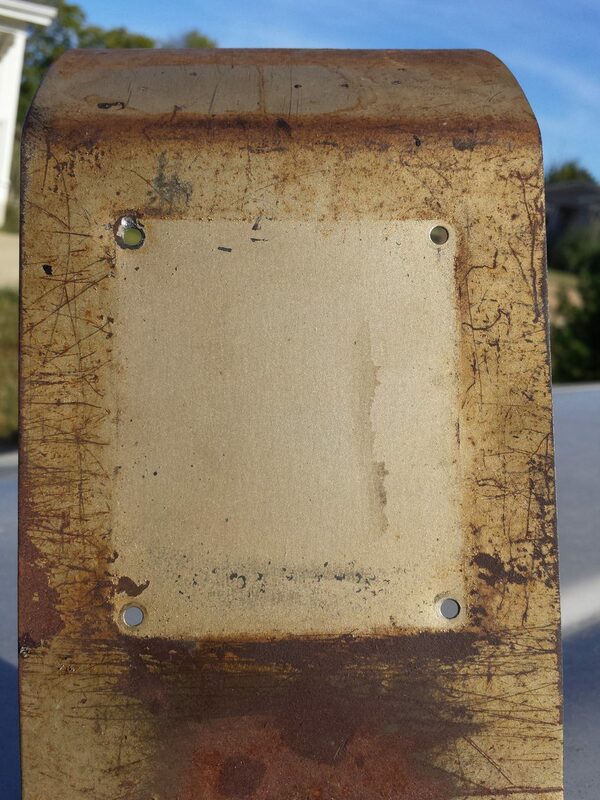 I removed the nearly destroyed label and had the opportunity to see some un-faded original ‘power bronze’ paint. 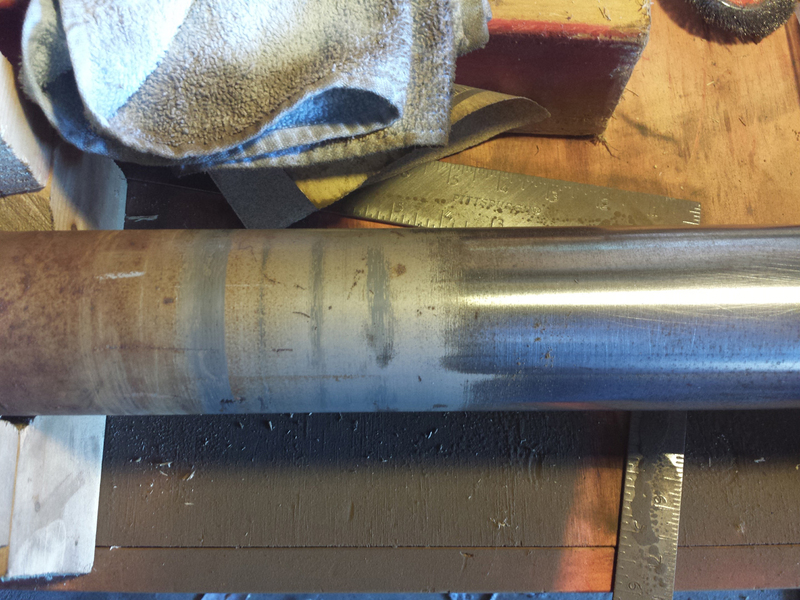 At this point, I removed the grinder from the base and started cleaning up the base. It was very rusty and there was some sort of solid mud/rust crap in the reservoir that I had to chip out with a prybar and a mallet. What a lark. 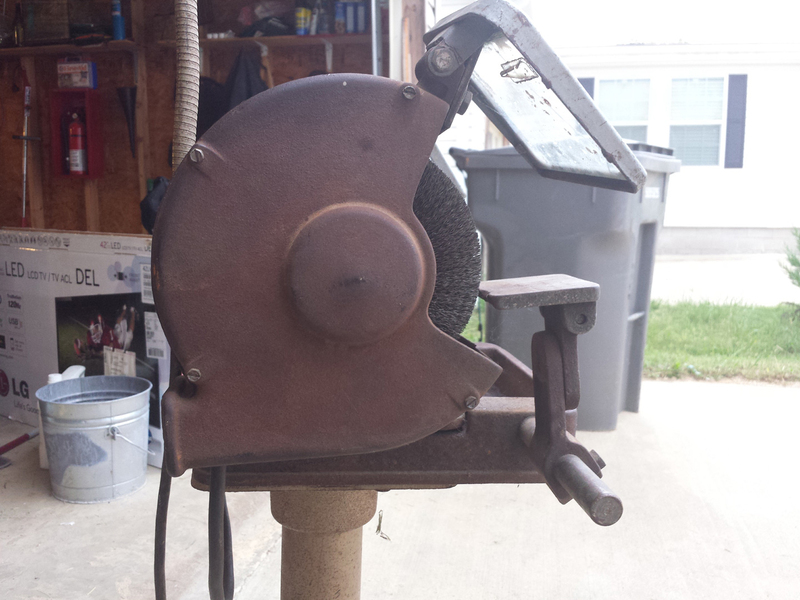 Underside of the grinder base. Pretty darn rusty. The underside of the base apparently collected moisture, probably from the water used in the reservoir. This looked like rust from standing water, to me anyway. 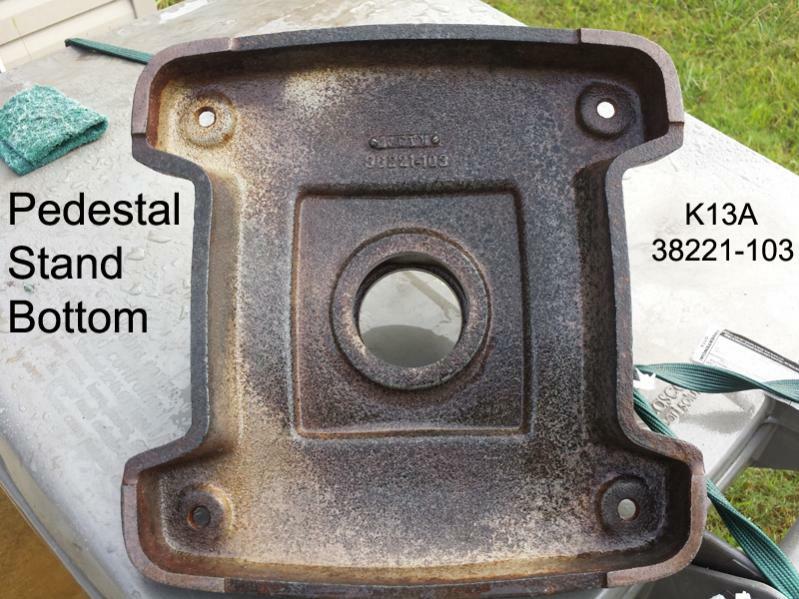 The tool rest posts are connected to the base with two 5/32″ hex studs, but even when I removed the studs, I had trouble removing the posts. 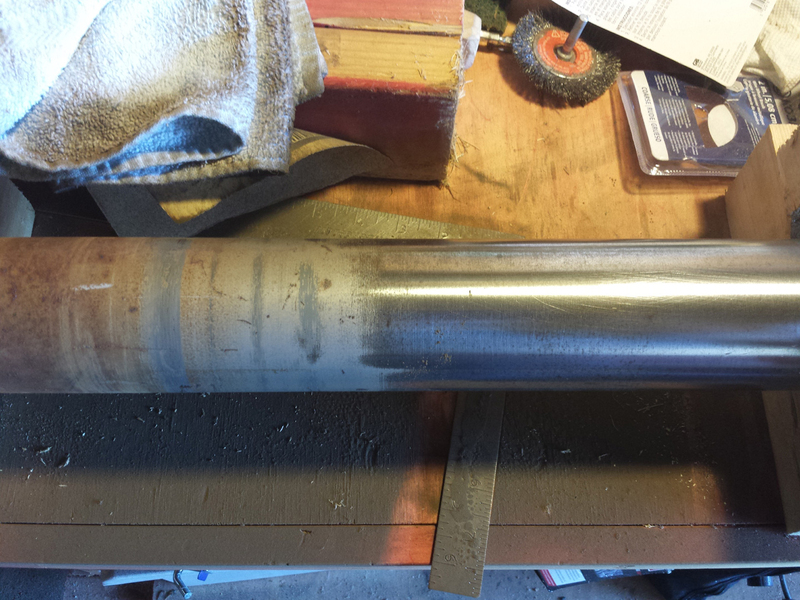 I didn’t want to risk cracking the base by whaling on it, so I left them in during the dip in my electrolysis tank. 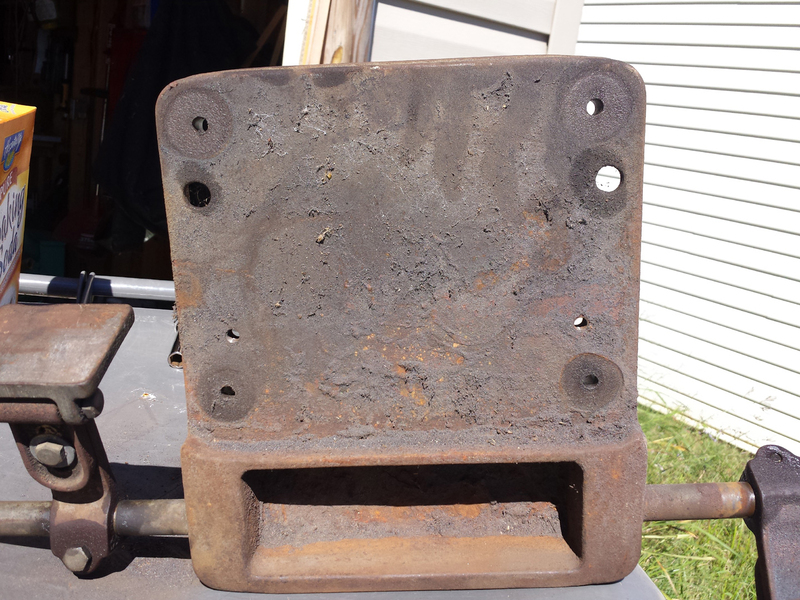 The rests themselves were removed for cleaning and to be painted later. 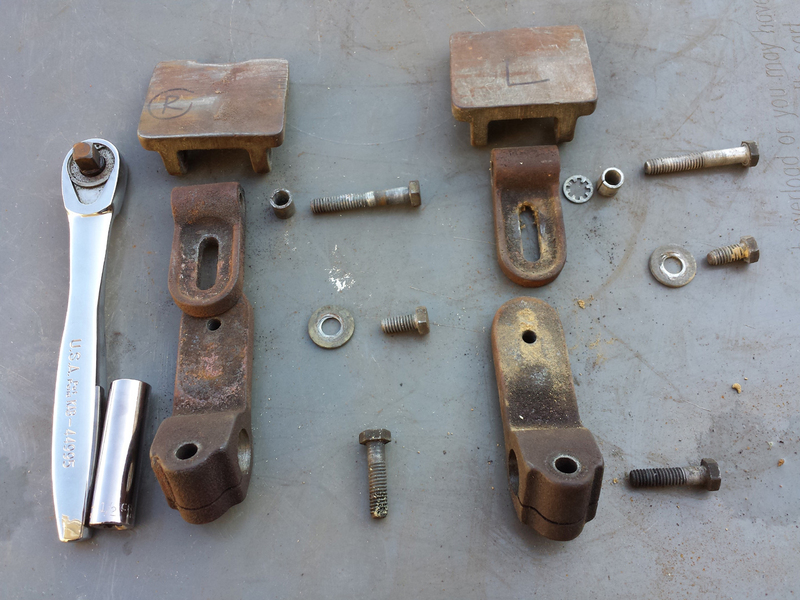 Components of the beefy tool rests. That’s a 3/8″ Craftsman thin profile ratchet for scale. 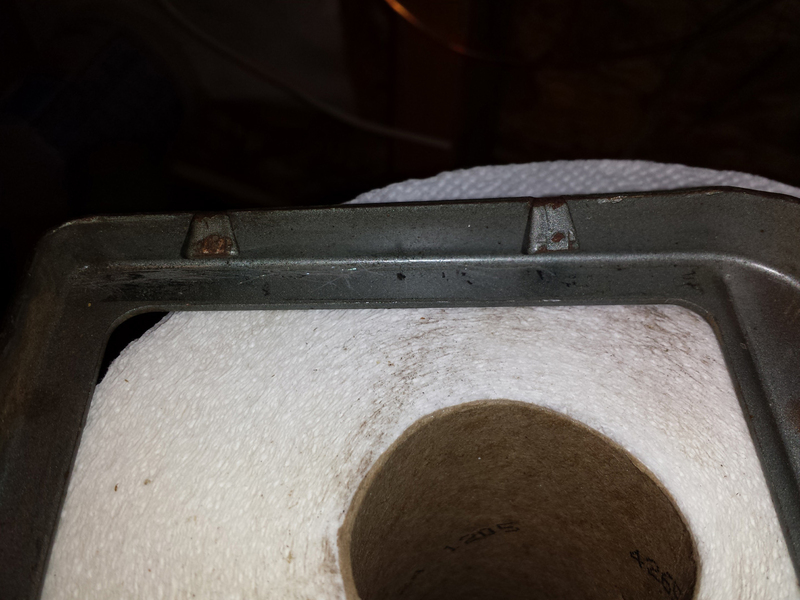 One of the rests was ground into by the previous owner. I’m not too worried about it. I could always grind this out, but it’s not a big deal. 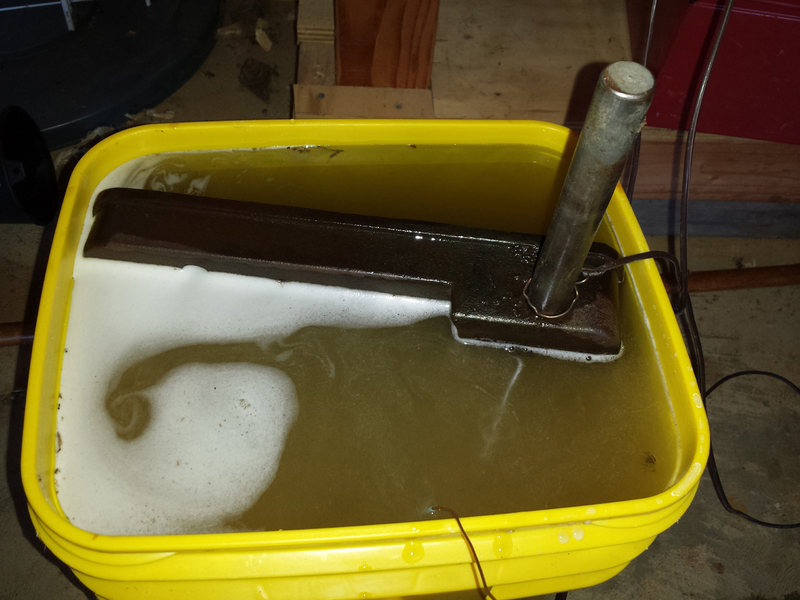 I didn’t have a tank big enough for the whole base, but I got the cast iron part of the base mostly submerged, anyway. I’ll flip vertically later, then front-to-back to hit the rear. 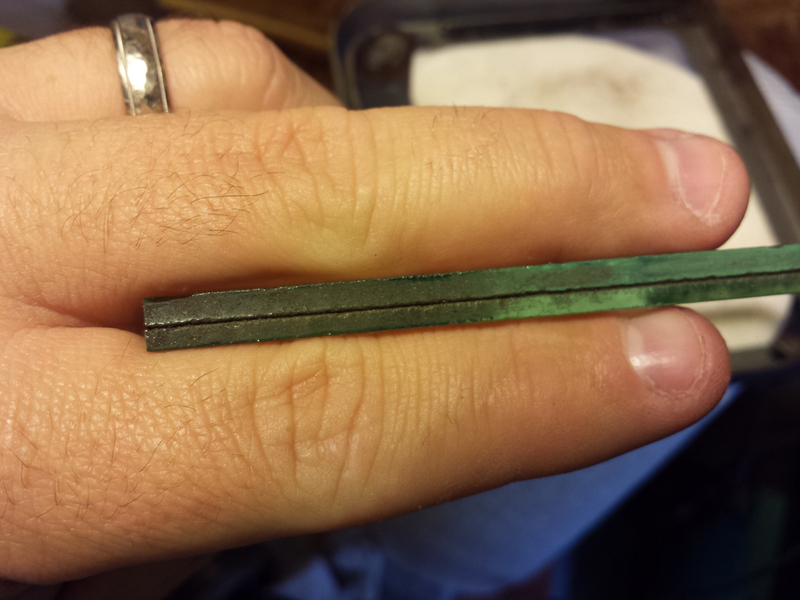 The anode is a big chunk of RR plate. Now, if I was going to leave the part unpainted, I wouldn’t leave it partly out of the water, because I suspect that will give me a dark line that won’t be removable; but, since I’m going to paint it, I don’t care. 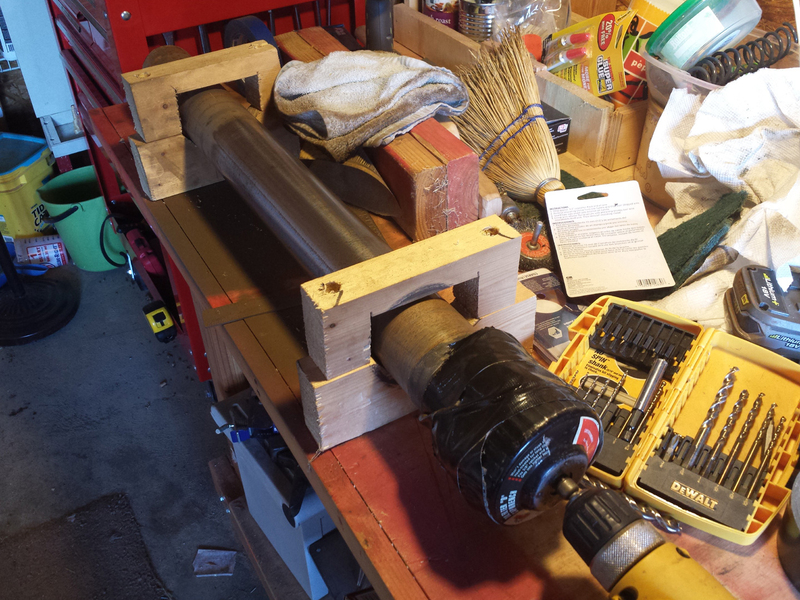 Both ends of the tool rest posts are going to be (at minimum) submerged fully and later sanded, so they’ll be ok too. Below, you can see my handy-dandy electrolysis power supply, which I modified from an ATX computer power supply. It even has fancy LEDs on the cooling fan. Please ignore my messy floor. I was in the middle of cleaning. . . it definitely doesn’t always look that way. 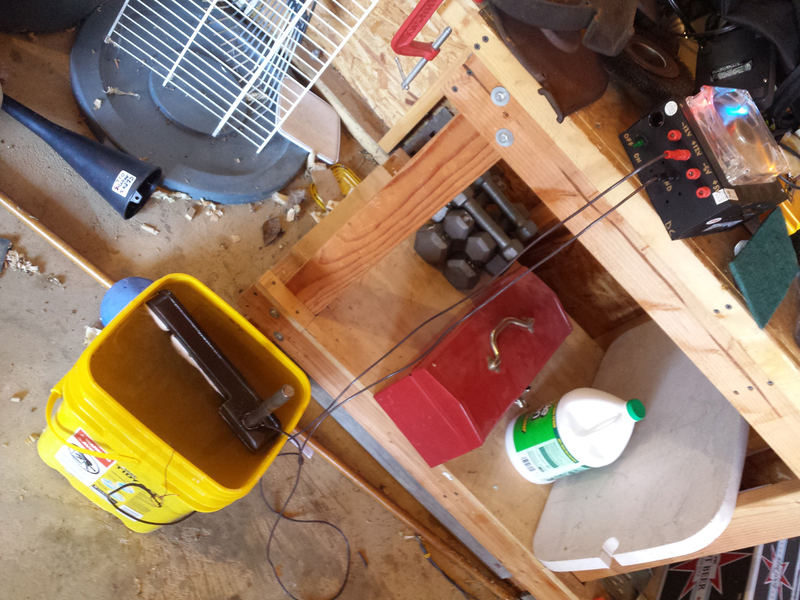 Here’s my early electrolysis tank setup, using an old power supply unit from a computer and a kitty litter bucket filled with a baking soda electrolyte solution. Allow to simmer for 2 hours, then add carrots and celery. I should have used a bigger container of electric death, since there will be a line etched into parts at the water surface. Not a big deal here, since I’m going to paint the base. 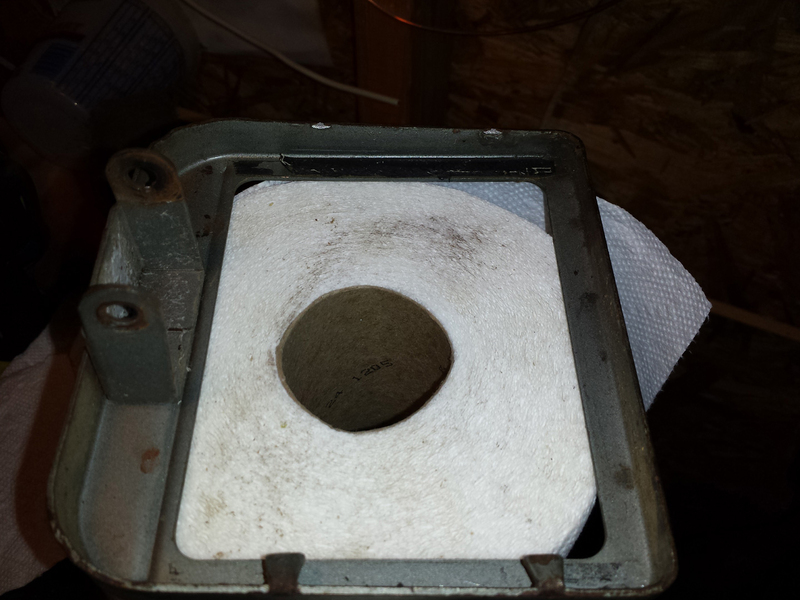 Next, I cleaned and primed the quench tray base. I never could get the rods for the rests out, so I just taped them and used them as a handy hanger instead. Here’s the base halfway through priming. I used Rustoleum Pro gray primer. 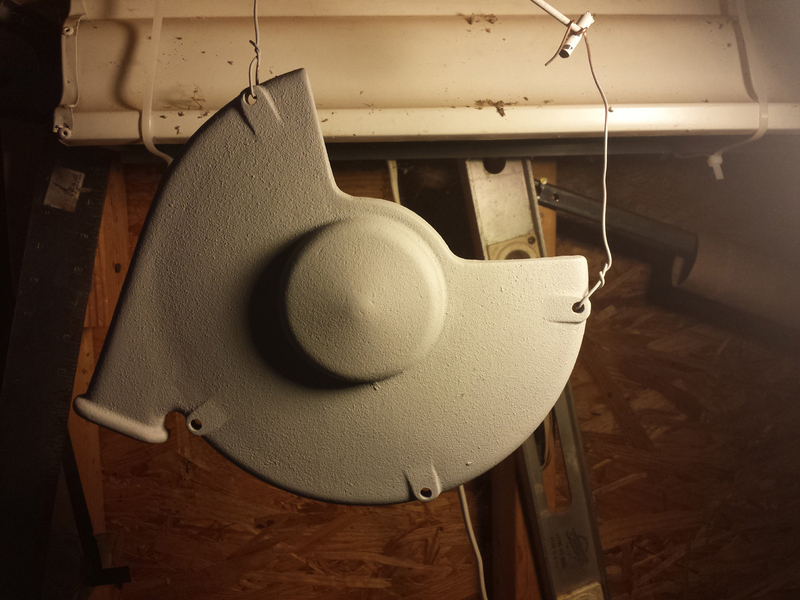 I also hit the other outer wheel guard with primer. No pics on that one. 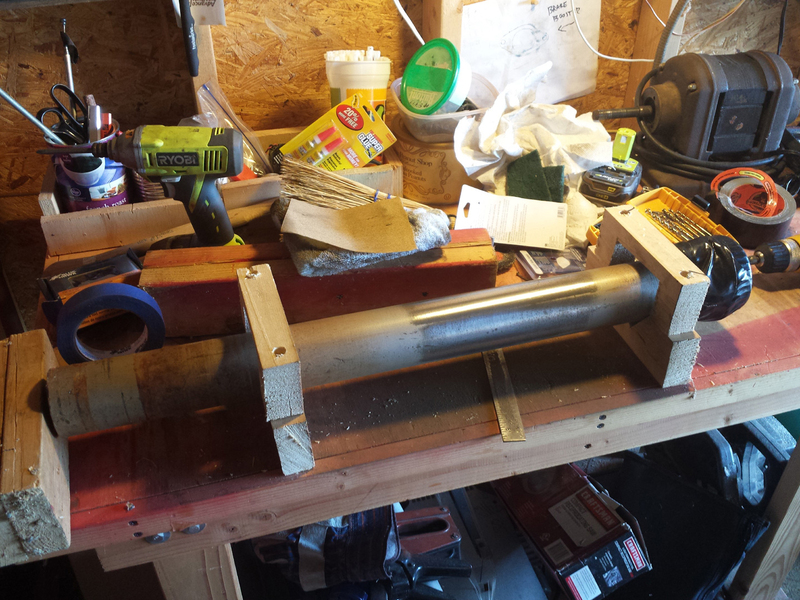 To de-rust the stand’s pole, I MacGyvered a makeshift lathe using my smaller workbench and an electric drill. I don’t think this was the safest thing I ever did. 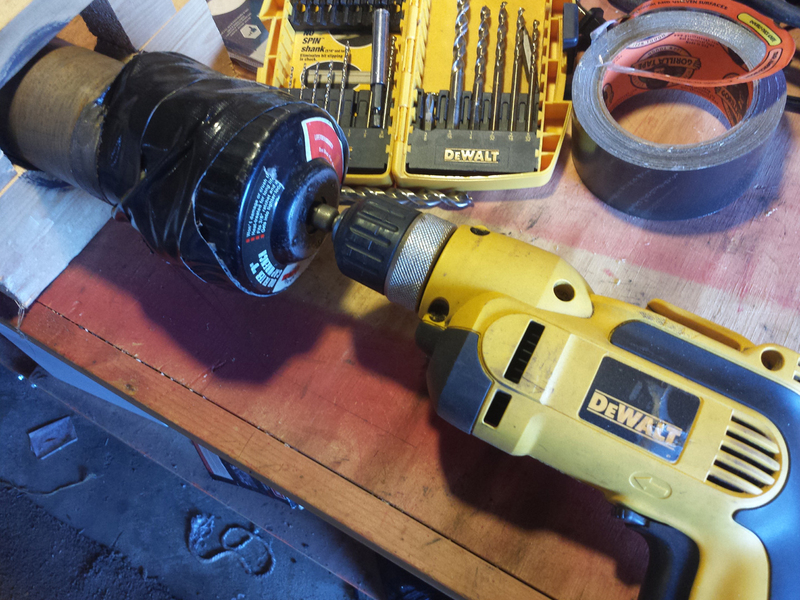 I built a cradle from 2x4s to hold the pipe, then taped on an oil filter cap socket onto one end and connected that to a drill using a 3/8″ male adaptor. 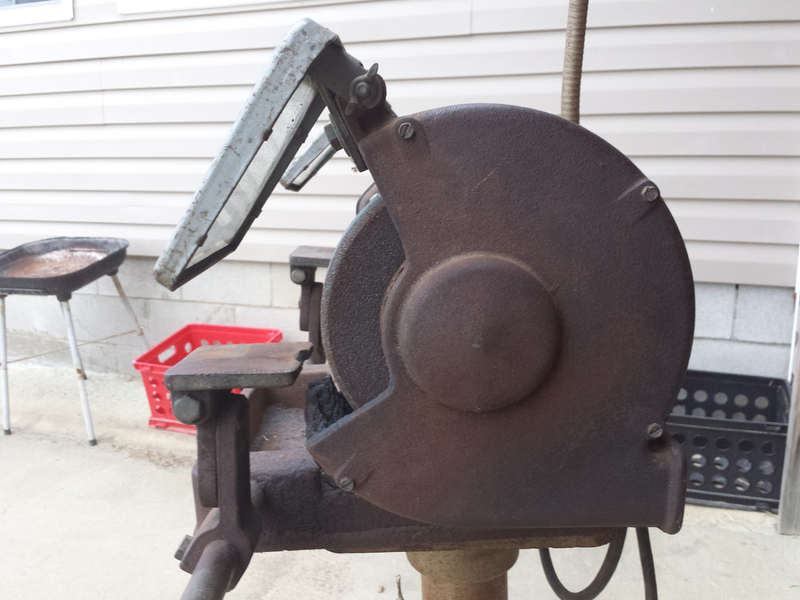 Then, I spun the whole death-match with one hand on the trigger while applying sandpaper to the spinning abomination. It actually worked like a charm, but it was scary. 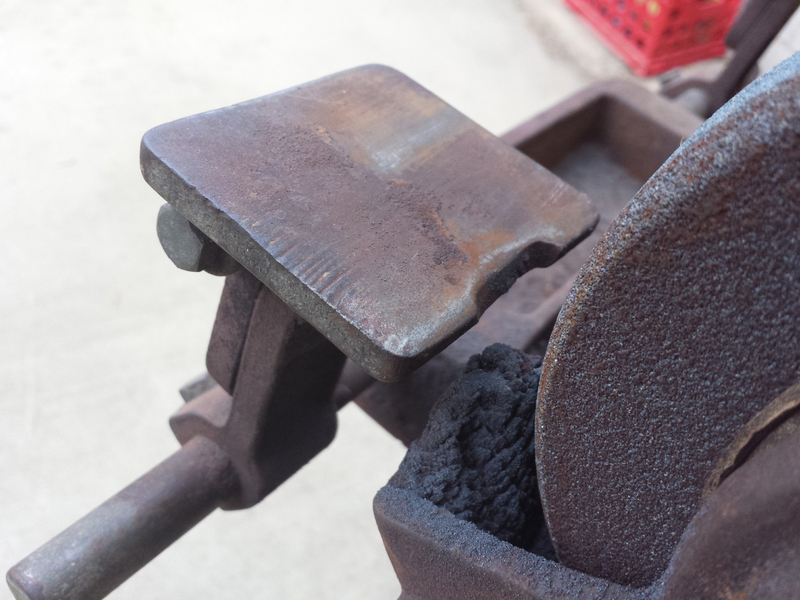 The cast iron stand base was pretty rusty. 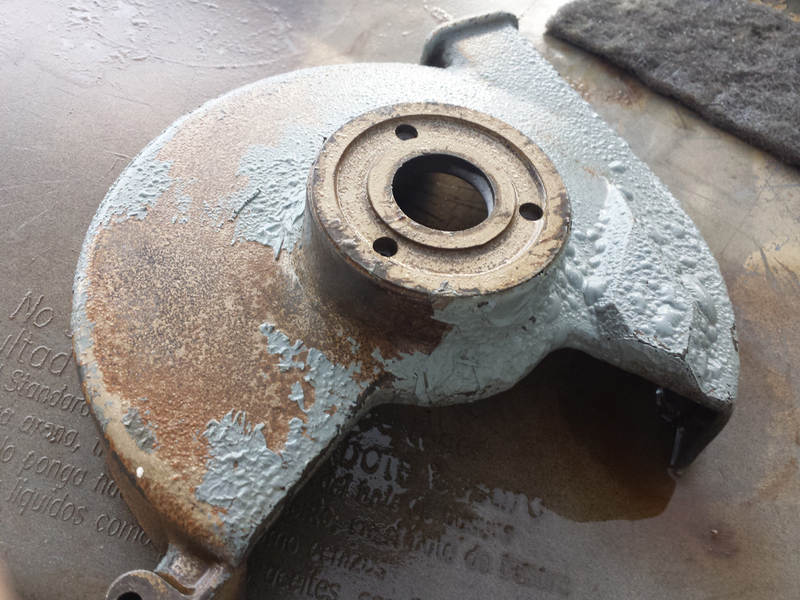 I de-rusted it, wheeled it, primed it. Wash, rinse, repeat. 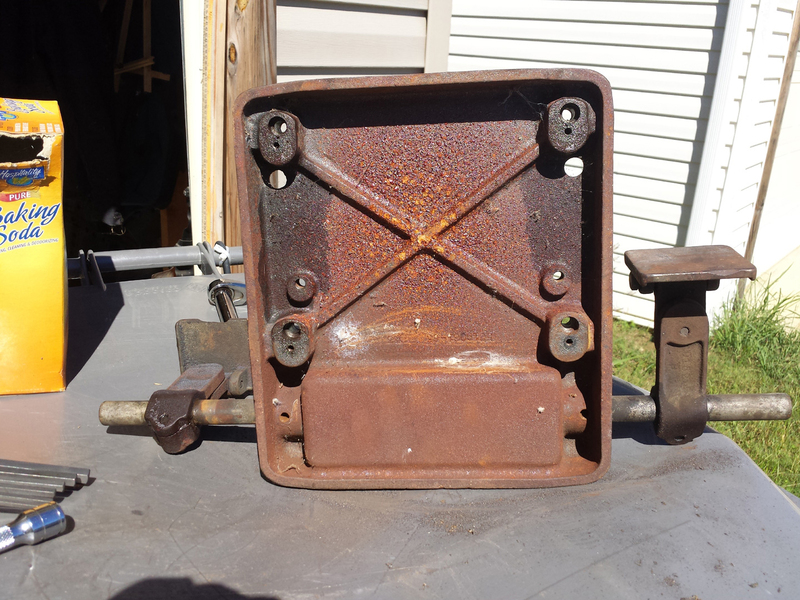 Partway through wirebrushing off the rust and old paint from bottom of pedestal stand, the bloody thing was already flash rusting in the hot sun. 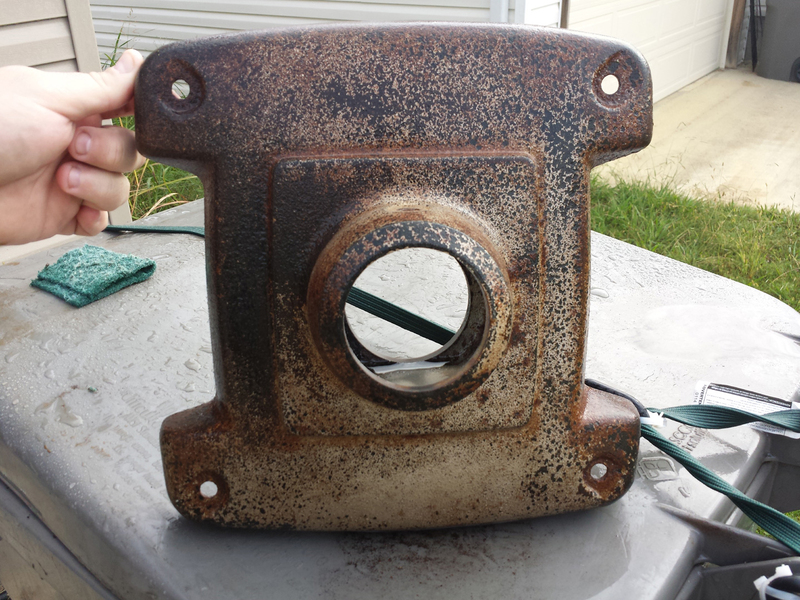 I ended up doing a quick rub with a scotch brite pad to get most of the flash rust off, then just primed right over it. I’m sure the original paint job was done over some flash rust back in 1958. 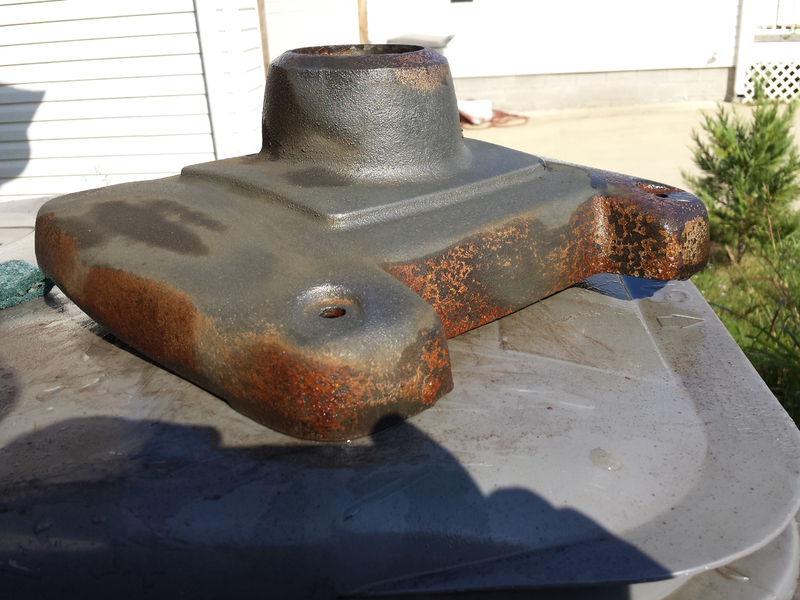 I think the primer said it was ok to paint over a little rust that wasn’t flaking. No way to avoid it that I’m aware of, short of oiling or waxing immediately as you expose the bare metal, but then your paint wouldn’t adhere, of course. 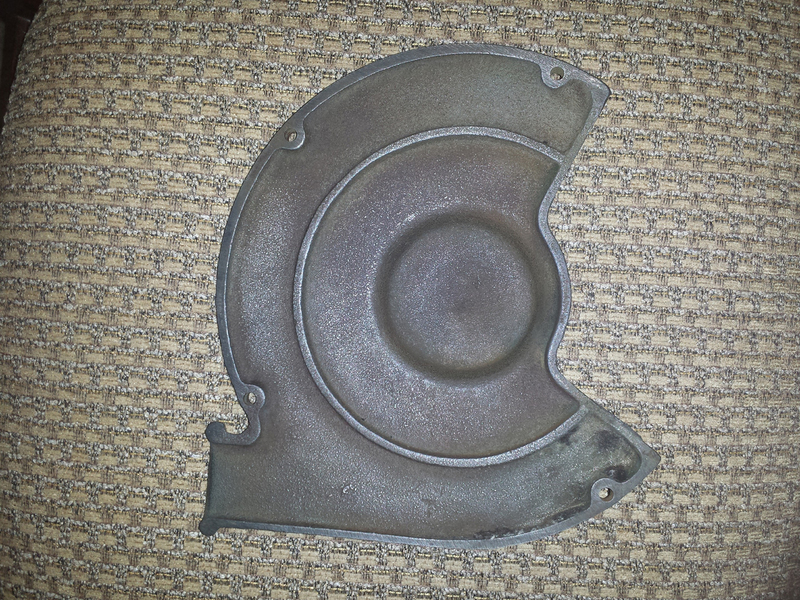 I tried drying the stand top on the stove to try and mitigate a problem I was having with flash rust. It sort of worked, sort of didn’t. 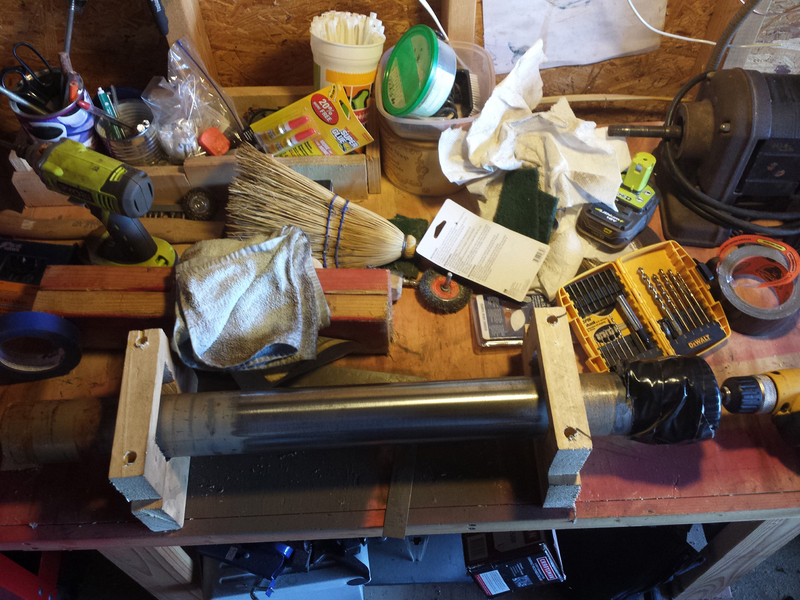 I got it primed eventually. I thought I’d include a number of photos showing the cast-in numbers from the parts I was working on for reference, in case anyone was doing research. 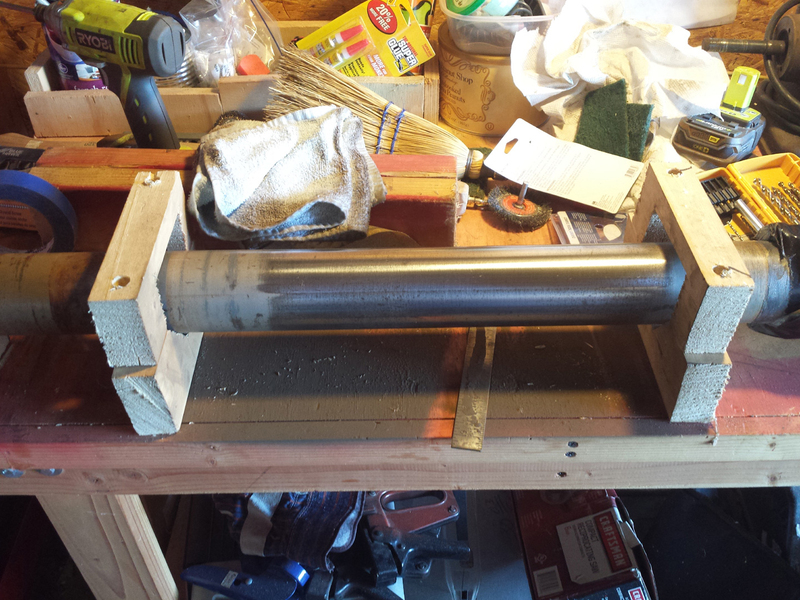 The top part of the pedestal stand (upside down), as I’m drying it over very low heat on my stove after scrubbing off the oxides produced by electrolysis. 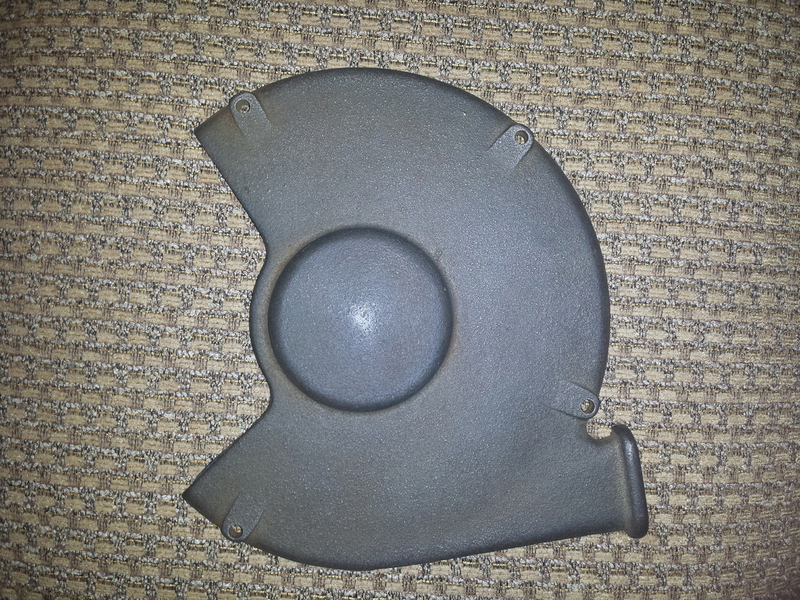 The little plate with the screws is actually the impression from the casting mold (i.e., there are not any real screws in the part; it’s just the impression from the screw heads). 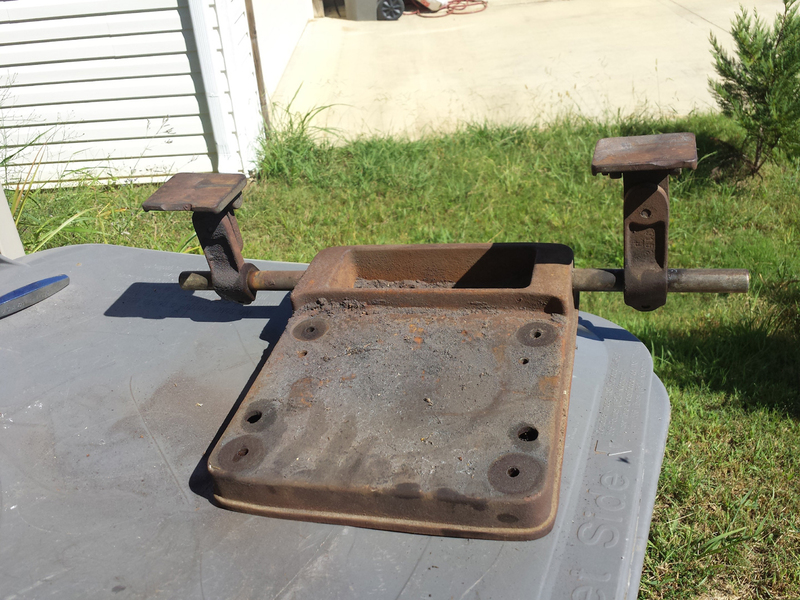 This is the upside down top of the pedestal stand. 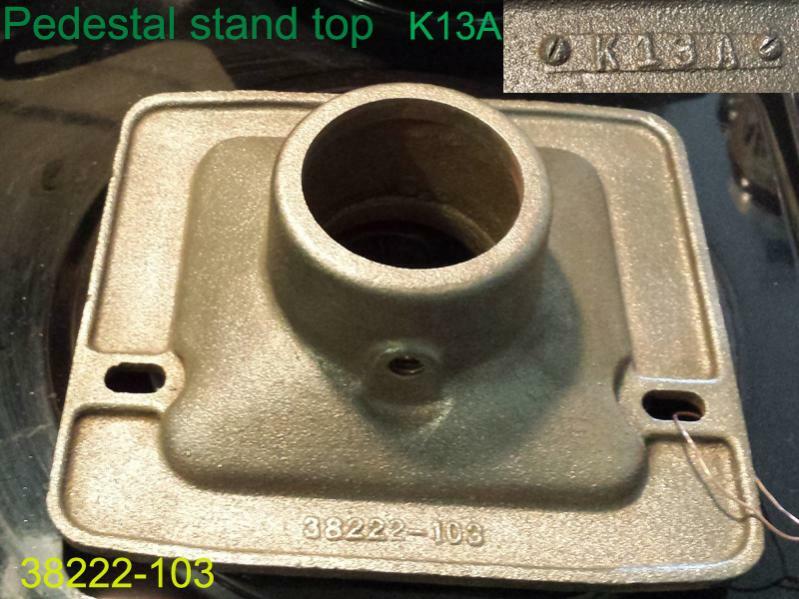 This is the upside-down base of the pedestal stand. The eye guards were originally gray, but I thought they’d look sharper in bronze. The glass was semi-permanently affixed with an adhesive and four metal tabs. The tabs are impossible to bend out in order to remove the glass. The tabs immediately broke. I will replace the glass and glue it in place with silicone. The frames were wire-wheeled for painting, then primed. The original glass was laminated. I’ll look for a polycarbonate replacement, most likely. 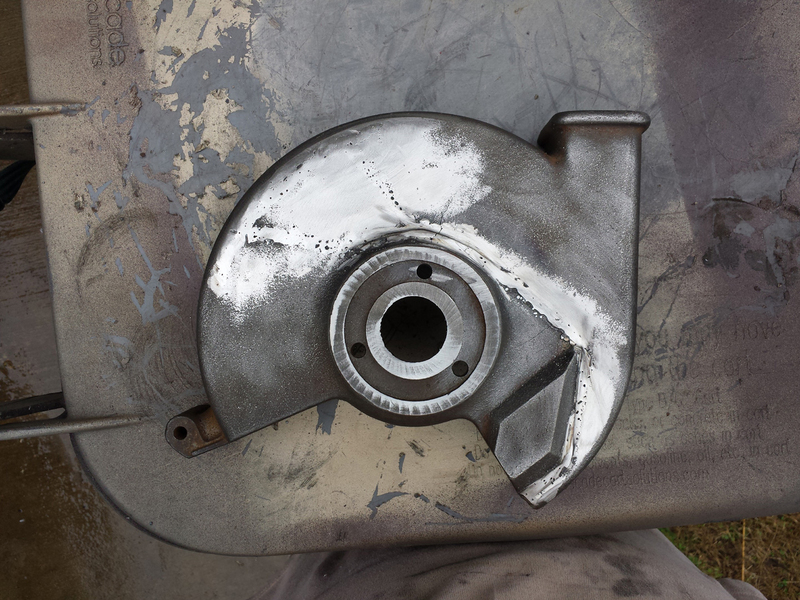 So to recap: at this point, I had cleaned and primed the pedestal stand, the inner and outer wheel guards, the grinder quench base, the eye guard frames, and the center band. 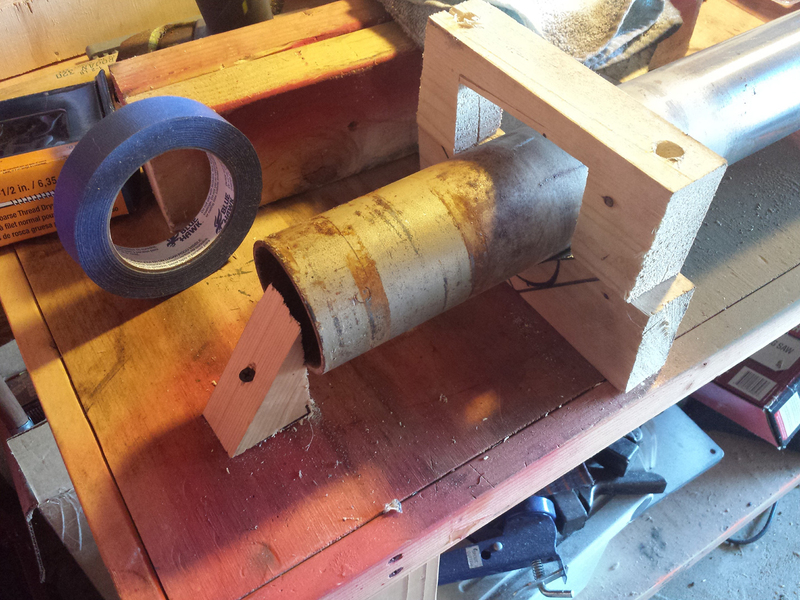 Next up: opening the grinder case itself and refinishing the end frames.